You often paint realistic figures and landscapes. 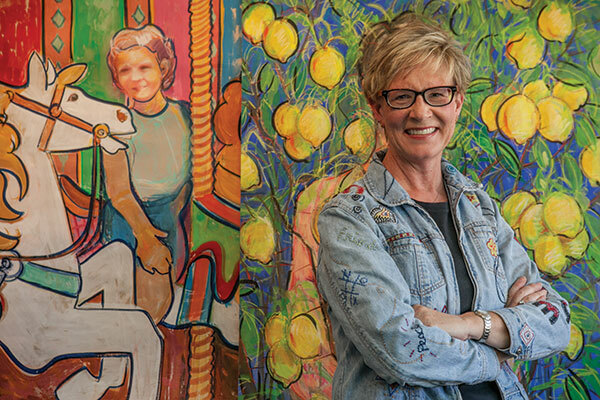 Can you explain how your more expressionistic art is about therapy? It’s about therapy because it was therapy. In 2004, in December, I found myself in a state of depression that I could not shake off, and realized that I wasn’t going to fix this by myself and I needed help. And I sought out a therapist. After the first painting, I realized that this work was so unlike anything I’d ever done before – as you say, expressionist. Tell me about that first painting. Intentionally, I said, “You’re going to try to paint what this feels like right now.” I was going to paint my kind of depression. And so I started the painting with red, spiky mountains. My kind of depression felt like a really jagged, pointy, volcano-type mountain ready to come unglued. I’ve spent a lot of time in the High Sierras. 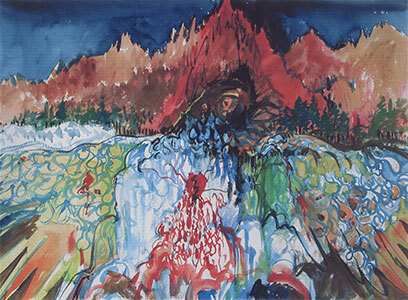 I painted for galleries in Mammoth Lakes for 20 years. So the Minarets and the jagged mountains of the eastern Sierras are something that I love, and they refresh me and inspire me. So it made a lot of sense to move from that kind of imagery. When that turns dark, what does it look like? I painted the mountain range, painted the dark sky. Then I got this sort of cave shape. And then I painted a monster in the cave, because that’s how I felt. There was this monster inside of me and I couldn’t get it out, and it was sad and hidden and buried and hot and nasty. And then I started drawing these little lines and then, OK, the forest is showing up. And then the monster starts to cry. I was depressed; I cried a lot then. So these tears turned into a waterfall and the water went along this way and it came down. And when I looked at that, I went, oh my God, that’s an eagle. So the water turned into feathers, and I saw this eagle. There’s this eagle trying to fly, and it’s got the mountains of the world on its back. This was the first painting I did. It was a complete revelation of what I felt like. I’m this eagle, and I’ve taken on this burden of the world, and it’s killing me. How did you know the art therapy was helping? The reason therapy works, when it works well, is because there’s a relationship that you set up with a person who is there for you. And that relationship is the cure. I was motivated to help myself, but I was also motivated to respond to his response to the paintings I was showing. And it was fun. Seventy-two paintings later, I was pretty much sold on the power of this imagery. It worked so well because the therapist was so good. It worked because this was my language. But I think it can work for everyone if they give it the time and the energy that it takes. And I worked very hard at this job of getting better. You cannot just do this lightly. What else did you paint? 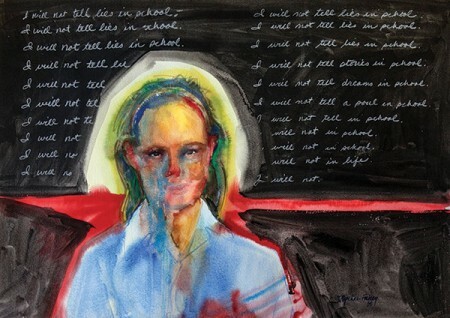 In “School Girl,” I was having a great time painting this melty watercolor, which I think just epitomizes “sad.” I painted that sad kid and then I painted this red thing going right through the neck. When I saw that, I was immediately struck with the notion that the line was a chalkboard rail, and that I’m a second-grader standing up in front of the chalkboard. And I was brought to the time when I was humiliated by my second-grade teacher for telling imaginary stories. I will not tell lies in school. I will not tell stories in school. I will not tell dreams in school. I will not tell a soul in school. I will not in school. I will not in life. It just encapsulated this whole feeling. What do you do when your motivation is everyone else’s expectations? You bury those feelings for your entire life. I don’t see a little girl when I look at this. Who is that person? Do the paintings get happier? Is there a progression? Yes, but it’s not linear. There were days that I was really depressed and there were days that were hopeful and there were days that were pretty joyous, and the paintings kind of reflect that. What about this one, “Carousel”? When I looked at all of the photographs I had, I think the only time I was smiling was when I was on the back of a horse. And so I put myself on a carousel (see detail on Page 13, at left). I think I was 5. “Carousel” was kind of, what would you give to the kid to make her feel better? You take her out to the horses, because you get on a horse and you run and you’re free, and there’s no mountains hanging on your shoulders. I love to get on horses to this day, because they represent freedom and power and total joy. Love it. Are you still painting like this? Unfortunately, I’m not making any great expressionist work anymore, because I’m too happy! I consider it to be a complete gift of serendipitous nature to have gone through this pain to end up at Cal Lutheran doing really the most creative work I’ve ever done. It’s a gift. Every day I come here is a gift from this pain. For more images of Spehar-Fahey’s art, including therapy art, visit terryspeharfahey.com.